A resume is a mirror to what you are and whatever you want. Resume is ideally a piece which talks about you and how you are. It talks about the skills you possess and the qualities that you are an expert at. Thus be sure that the resume is going to speak a million things about you. It is the ideal piece through which you will be entertained in a company. Without a good resume, it is difficult for you to be known anywhere and spoken to. Therefore, anyone can judge a great deal about you when he or she has seen your resume. In the same way, an effective resume title is also necessary for a well-written resume. However, in today’s world, everyone makes a resume. Everyone can make an effective and interesting resume which does a great deal in talking about him or her. The challenge these days is to make a resume which will speak about them the first. There will be a pile of resumes lying out there on your employer’s desk and all you will need to do is make sure your resume gets picked out first. What is meant by good resume title ? A resume title works out a great deal in helping someone know more about the person in a very attractive way. Why are Titles Needed on a Resume? When you are in the mood to edit or create your demonstrating and vibrant resume, you are asked to give a title to your resume. The name or the title you pick will be nicely featured across the very top of your resume in a nice, bold and colored text. This is going to be the resume headline, so one must select a name that would be memorable and yes definitely, professional. Experts have suggested that learning about some appropriate resume titles examples is important before you start writing would help the resume get a good title field. First, one must conduct a nice search for some representative job titles that would interest you,” says Ginger Korana who is the principal of Taking Charge Coaching in Phoenix. The title is like the first impression you draw upon the person. The better the title sounds, the better it would be for the person, to enter into that resume and know more about you. Try and not limit your word and use them as tactfully as possible. Titles are essential in telling you whether you are qualified to take up that job or not. Thus, don’t be afraid at all to use abbreviations only because you have to save space. Also, one must keep in mind that the goal and essence of your title is to compel employers to keep reading your resume. Thus, if you do not want to be a loser and make sure things are sorted for you in your life try putting a resume title. What Should a Resume Title be Like? An effective profile title in resume includes everything. However, it is also not good that you try and infuse everything in your resume title. It has to include your resume objective and it will take into account your strongest qualification. A title can include various important points about you and your life. Some people actually prefer their profile title for resume to be as short as possible and just say something about themselves. For example, Raja Shah, C.A, Fresher. A title may want to include some more details about the person, for example in the above title, if you think Raja Shah, Fresher is not enough you can add Raja Shah, C.A, Fresher, Plodder College. The name of the college adds weightage. It makes the employer want to take your resume a see and read more about you. Do not be worried or weary to put more details about you, because that may just impress your employer all the more. You can also choose to add something more about yourself. For example, people like to say that they are experts in different fields. They would say that they have done such and such thing, in their resume title for example now this Raja Shah can easily become Raja Shah, C.A, Skilled and Expert. A resume title can also be made nice and accentuated if you put more of some details about yourself and make it look better. Some more details, something nice which can make the employer immediately show an interest in you. Something like Raja Shah,C.A, Talented and Dedicated. Try to keep your resume title as concise as possible Do not try to add more details in it or make it flow because it is never going to impress your employer. Thus a title must have all the words which make a person know more about you. Thus, a resume must be good actually very good. There are also certain things which you must keep in mind to remember what you must not put in your resume title. Employers want some serious people who are professionals who don’t need to rely or depend on gimmicks. You may or may not use your name as it completely depends on your professional output. It is your call and your choice. For me personally, a name helps one associate oneself to that person. It is easy to sell others not yourself. Machines interest me, you would too. I am good at it…will make you good too. I serve and teach, I do the deed. 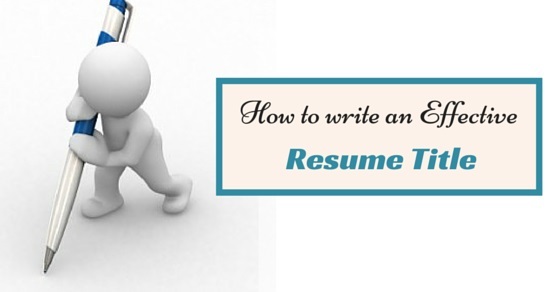 Thus, the resume title making is not that difficult, you just need to put your time in it. Take your time and learn.